The master clutch cylinder is bolted to the pedal box at 6 and 12 o'clock above and below the piston arm, making it difficult to access the bottom bolt. 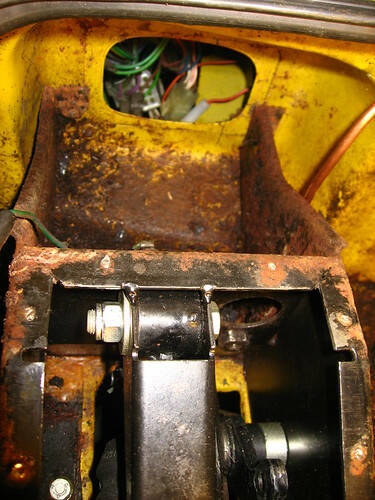 The confines of the pedal box with the pedal arm and piston effectively block direct access on that side and the cylinder itself makes it impossible from the other. The only way to access the bottom bolt is to remove the rubber blanking plate from the rear of the cylinder, behind the steering column under the dashboard. You can then use a ratchet with a long arm to undo the bolt. It is a tight fit however, and you need an extension which is the right length - too long and you won't be able to manoeuvre it into place in the tight confines, too short and you just won't reach the bolt.